Mikey, aka “Mr. 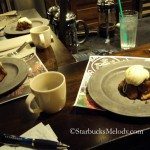 Opportunity*,” hosted a fabulous coffee tasting at the Olive Way Starbucks tonight. I attended, along with a large crowd of nearly a dozen people, some partners, some not. 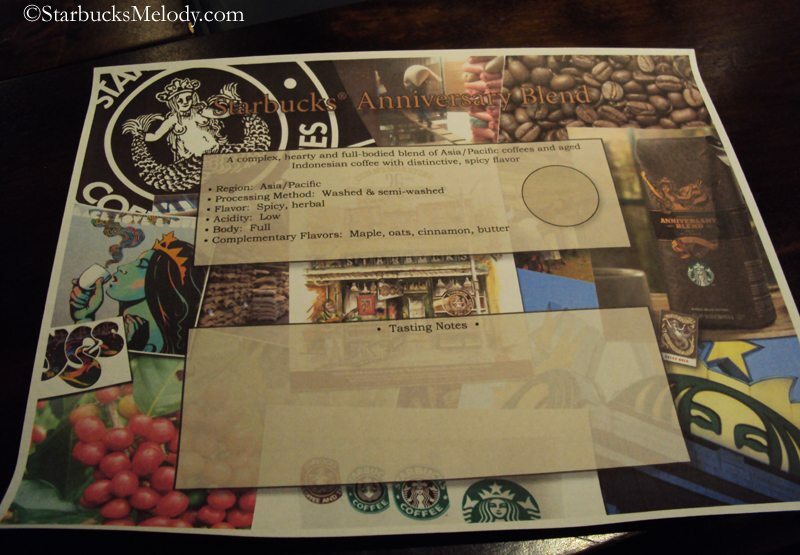 Mikey made a couple of French presses of Anniversary Blend, and prepared a guided tasting note sheet. 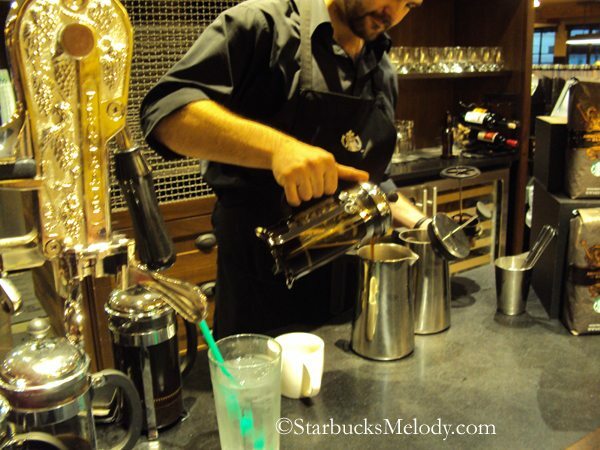 We walked through the traditional four steps of a coffee tasting: 1) Aroma – what aromas do you smell? 2) Slurp – Taste the coffee with a big and loud slurp. 3) Locate – Describe where the flavor notes hit on the tongue. 4) Describe – Describe all the flavor notes, and body characteristics that you can identify. 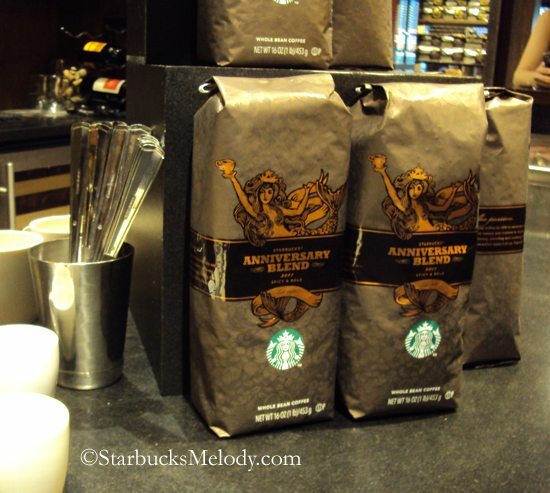 By the way, Starbucks has offered Anniversary Blend every single year since 1996. (*For those of you who do not know who Mikey is, please do this: Go to Starbucks. Pause at the front door. Look for the window cling that talks about “employment opportunity.” There he is! Mikey, a partner here in Seattle, is famous as a window cling in 17,000 stores!). 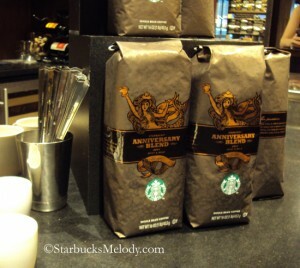 Anniversary Blend has some aged Sumatra in it which provides a spicy characteristic to the coffee. Most everyone in the crowd could quickly identify some spicy aroma, described a bit like baking spices such as nutmeg and cinnamon. The Anniversary Blend has a lot of its flavor in the back of the mouth, and it is complex with a very small amount of acidity on the sides of the mouth. However, the major, more predominant tasting note was the spicy bold flavor with low acidity. Mikey talked a lot about Anniversary Blend, and its unique characteristics. Everyone listened intently! Mikey had made a treat from home to pair with the coffee, and the treat was so delicious that it totally overpowered the coffee. Suddenly the coffee seemed unimportant and I wondered how I could bring Mikey home to my kitchen. 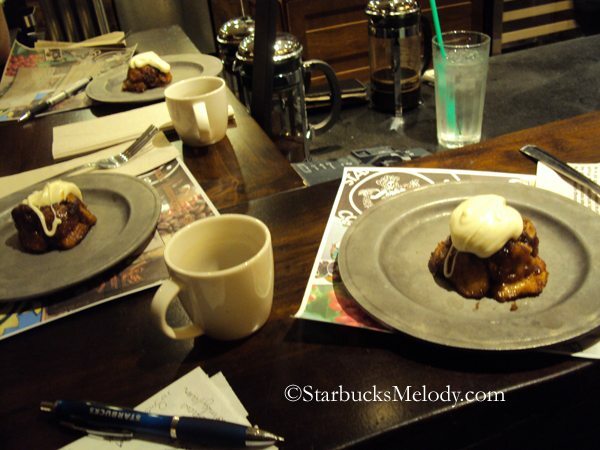 During this tasting, we also did a “butter” coffee tasting. I have to say, I was not expecting this. This was truly unique. 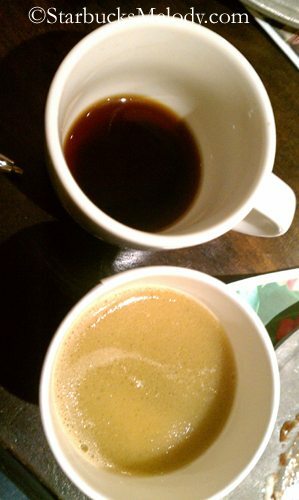 Apparently, as I understand it, Mikey learned from a friend of his (who had done some traveling in Bali, Sumatra, and Vietnam) that in some countries, it is common to drink coffee with butter. Fresh milk can be more rare to come by than butter in many countries, and so I learned, very dark roast and bold coffees become extremely smooth and delicious with added butter. Especially in Vietnam, it is considered normal to take butter in your coffee. I had cringed a bit at the thought of drinking a coffee with visible buttery oils forming in it, but much to my surprise, it was delicious. Mikey was absolutely right that butter does work with Anniversary Blend. Don’t forget, Anniversary Blend is a limited offering, so this is the only time of year you can find it in stores. Ok so I know you are in Seattle and I know the passion of partners there is quite different than in other parts of the country, but why again I ask can’t we get these wonderful tastings. 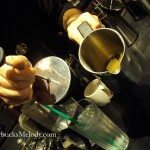 I loved reading about the different approaches Mikey used to taste the coffee and the butter aspect is certainly interesting. What was the home made dessert he made? Thanks Melody for the pics and the visit. Well, I would have a very surprised rxn at first to this idea, also. But, when I think of it, I could see how it could make sense….especially with something spicey like Anniversary…..kind of cream with your coffee, I’d think. Also, if anyone is very much “into” baking, it’s recommended to (almost) always use unsalted butter (in baking, whether the recipe calls for it or not) . always a bit sweeter. Very interesting Melody. Thanx again! @purple1: I would take it upon myself to try and make some of these things happen in my own store. (too bad it IS that way but, that’s what I do….what I’ve done actually) This butter-event might be a little tricky …but, I can imagine how much interest it would get! Denise it is true that I should ask about doing tastings and other events and I have mentioned it to the SM a while back and just have not approached him recently. I just get a sense that there might not be motivation to do it. I have seen, however, some samples of late but have never seen a tasting. What an interesting idea. I am going to try this with my partners. purple – I agree with Denise. 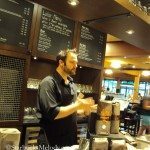 I think that if you have interest in coffee tastings you should ask the SM of your store about it. If they can’t do it there (for some reason) maybe the SM will know about another store nearby that does do this. Also, depending on time of day and how busy it is, there shouldn’t be any reason that they couldn’t do a one on one tasting with you by request. I’ll have to try the “butter coffee”. Melody, thank you for sharing this with us! Anniversary Blend is always a highlight at my store and I want to try the “butter coffee” (two tablespoons for an eight cup press seems like a lot but I’ll make it a treat!) And I also would like to know what Mike brought from home for the tasting. @purple!- You might have to take it upon yourself to do the tastings *make sure you clear it with your SM*. Ask your partners and customers if they’re interested in participating and if you believe there is enough interest, have one. If there does not seem to be enough interest at your stor, check with nearby stores and their partners and maybe do a group tasting. 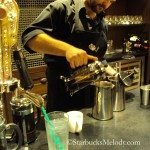 And you can also express an interest in earning your Coffee Master certification and incorporate that. Clearly you have a passion for coffee so share it with others and it will spread. Good luck! Hmmm… I would like very much to try this in my own store. I’m going to see if I can sell people on it, and do it. Nice to read about your impressions of Anniversary Blend. We started selling it here in Germany today and I did a coffee tasting with my Shift Supervisor. I would say this Blend is a good one and I really like this herb and spicy aftertaste of this coffee. It fits perfectly to dark chocolate (though I hate dark chocolate). My Shift Supervisor ironically said, it would also go well after having tasted Steak or good grilled meat. Sounds crazy, but due to the coffee’s dark and smoky taste this could really be true. Personally, I like it, but I still do prefer other blends like Breakfast Blend. PSS: AWESOME story about Mikey…yes, I can remember his face from our posters. HaHa! my partner and i went to this tasting as well, and i was sitting next to melody taking photos as well. http://yfrog.com/user/lyracole/photos (the top 8 photos *should* be the ones from the tasting. a quick note: this particular tasting was by invite only, and we all had digital tickets to attend (or we were supposed to, at least…tickets weren’t actually checked :). the olive way store does events like this from time to time, and the ones i have been to so far have all been excellent. the dessert was a maple cake of some sort, with a very sweet kind of layered mini-cake base, and an exceptionally rich cream cheese (probably) frosting. the anniversary blend seemed to act kind of opposite with me, hitting very definitely on the sides of my tongue and having kind of a thick roasty flavour, reminding me of memories of campfire smoke. it was spicy, sure, but i didn’t think at all of baking spices at first. i am known to have some taste issues, so this wasn’t really a big deal to me. it was still avery unique flavour as far as my experience with coffee goes. adding the butter was a little weird. the first few sips i had were pretty neat, but i found i had to swirl the cup a lot to keep the flavour consistent. it was very oily looking, and had an odd mouthfeel, as one might expect. my partner couldn’t stand the taste at all and gave up less than halfway through the demitasse sampling cup. i personally thought the butter made it taste more like a liquid baked good of some sort. the tasting sheet was very well done, i thought, with images from everywhere. 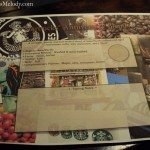 i was surprised to see a poster on the left side that i recognized from a friend’s collection of some earlier limited release starbucks art 🙂 and the surprise at the end of the tasting was super as well (a coupon for a free tall beverage at olive way)! Woah! cool never heard of butter in coffee, got to try that sometime… anyway you learn something new everyday! @Kitenarie – If you try this, tell me what you think! It was a great adventure to try one time, but I guarantee I’m not going to be regularly putting butter in my coffee! I think it is great to get an appreciation of how coffee is consumed in other countries too. @Elly – Thank you for adding so much! Seems like the new etched logo mug is very popular. Only one left on the shelf. 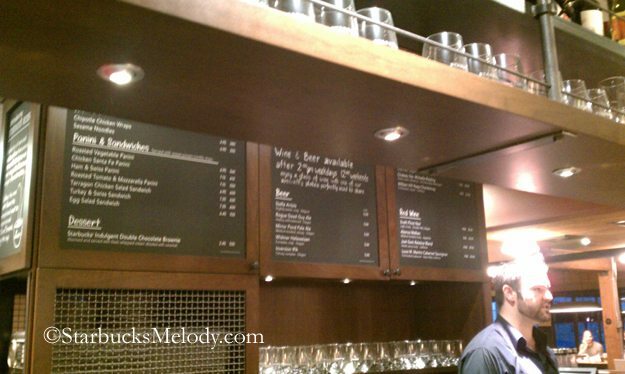 Wow…I remember saying I was looking for a coffee that had buttery notes to it…but that was not what I meant!! 🙂 Seriously, though I have a hard time imaging the tasting because that seem so obscure, but I could see how that would enhance some of the flavors in the blend. Very cool, I think I’m going to bring up to my store to do another tasting of something! No reserve stores, but maybe they could do one with the Anniversary Blend. I convinced two of the people at work to try this with me! So now I just have to remember to bring sweet butter to work when they are working. Oddly enough, one of them hates butter, but is intrigued enough by the idea that he’s willing to try it. I’m very excited about this! 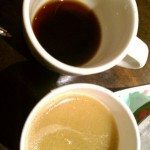 @DadCooks – I could see bacon coffee being marketed by someone some day! @Kitenarie – I can’t wait to hear how it goes. Honestly, 4 tbs might be a bit much. Try just a little less! Thanks for the tip, Melody! I’m really excited about this. I’m going to try Anniversary Blend with butter at my coffee tasting at the SSC on Friday! I’m thinking that I will serve it along side some crusty bread and Skillet Bacon Jam!!! I was convinced a few years back to put milk in my tea and it was so good! But it made sense. But butter in my coffee? I just don’t know about that. BTW, I have seen bacon coffee. I wish I remember where, I would go back and drink it. Darn! I’ll go back to sipping my coffee with regular old soy creamer now, lol. @Allie – I have heard of people putting milk in hot tea! Isn’t that fairly common in the UK? I’m not sure. It’s exciting how this post has inspired people to try this! @Allie (and other bacon lovers) — if you Google “bacon coffee” you get more 32-million results, seems there are several companies that make it. 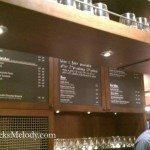 @Melody — milk in tea is a UK/English thing (India too). Most European and some Asian countries brew their tea far stronger than we do here in the Colonies. I take milk in tea. Is that unusual? @kitenarie: I think it more common in the UK to drink tea with milk in it, than without. When you’re there (in the UK) , it’s very easy to come to love it this way, and this way only! As someone that drinks alot of tea I guess I can’t get into putting milk into it because I think it dilutes the taste, but I do know in the UK it is a common practice as well as I know many people that will not drink tea here unless there is milk in it. I guess it is the same as anything- choose it the way you like it. Wow! Butter in coffee sounds intriguing. I guess it would not be TOO much different than putting heavy cream into your coffee? Or having a coffee misto with breve? 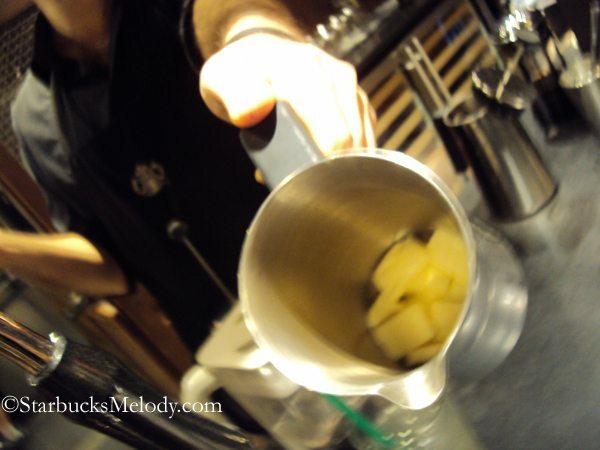 Since butter is usually refrigerated, does it cool down the coffee a lot more as it melts compared to cream or milk? Just last night I held a tasting at my store of the Anniversary Blend and those who tasted with me mentioned that they really thought about cloves when they smelled their cups. I really liked this observation! BUTTER!!! What a concept! I have never heard of this and it excites me more than I can tell you! Can I just get any old butter at the grocery!? Is the unsalted the best for a coffee tasting? I want to replicate this tasting!!! Melody, did Mikey press the butter? 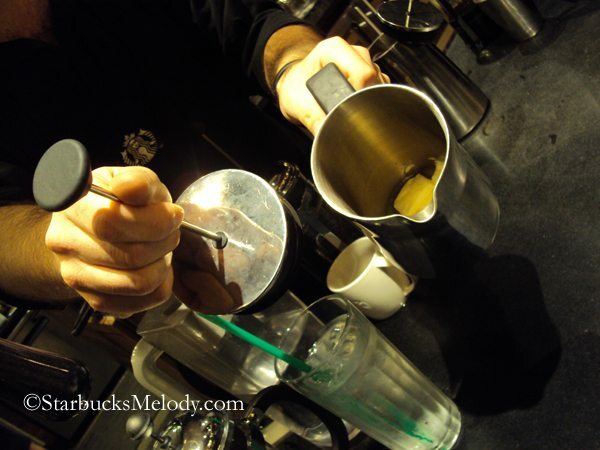 Or did he just pour it into the second french press pot without plunging? Butter and coffee…not sure I’d like it, but I guess I’ll have to give it a try! I tried it! I convinced a few partners to try this out, in spite of how wary we all were of it. It was interesting. 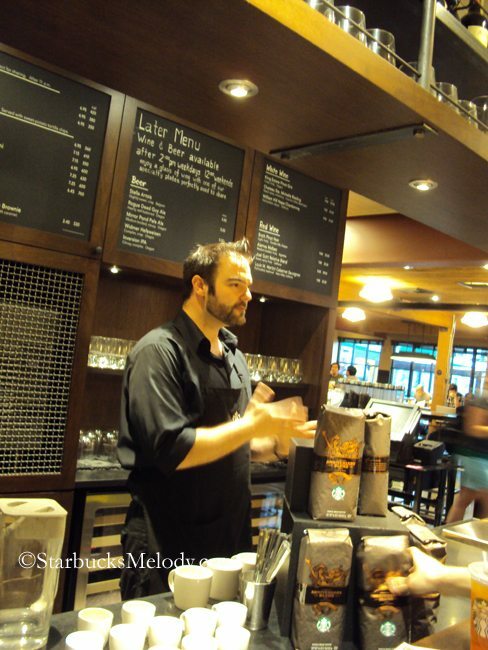 I want to try it again with a “sweeter” blend, like Verona or Gold Coast/Joe. The butter definitely brought out some nice flavor in the Anniversary, so I’m curious if it would do the same for one of the Cocoa-y coffees. Melody, I tried it with 3 TBSP like you recommended. I’m almost tempted to do the 4 if I do it again. It was good, but I want to try it the way that you guys did as well to see what the difference was. I drink coffee with butter every day. 24 oz coffee blended with 2 ounces of butter. I use Kerrygold butter,from grass-fed cows. The best coffee, very healthy. 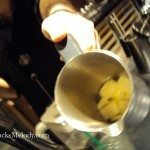 Hey, I’m from the UK and looking to try something interesting like this for my Coffee Master certification in September. My manager and I are both really excited to try butter coffee, and I have a feeling I will impress the District Manager and other real coffee professionals as it’s a real unique take on coffee. Thanks for the info, I really can’t wait. Plus – I can confirm it is common practice here in the UK to take tea with milk!